Interstate 395 shares a brief overlap with U.S. 202 between Exits 2 and 3 south of Downtown Bangor. The western end connects with U.S. 2 and Route 109. 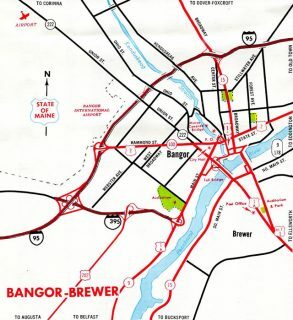 The northernmost branch of I-95, Interstate 395 constitutes a cross town route from Bangor International Airport (BGR), U.S. 2 (Hammond Street) and Interstate 95 east to Brewer and U.S. 1A (Wilson Street). 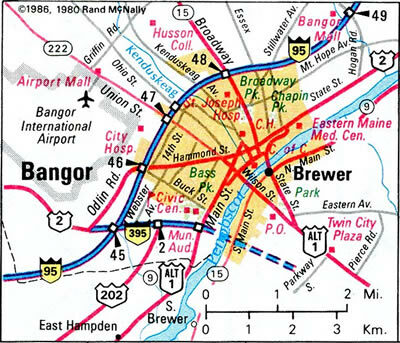 The freeway provides access to Downtown Bangor and the Brewer city center in addition to a trucking corridor east to U.S. 1A and Maine 9. Interstate 395 in Maine is part of High Priority Corridor 50: East-West Corridor from Watertown to Calais in its entirety. Interstate 395 originally ended at a trumpet interchange with U.S. 1A & Maine 9 (Main Street) on the south side of Bangor. Interstate 395 under construction in 1986. 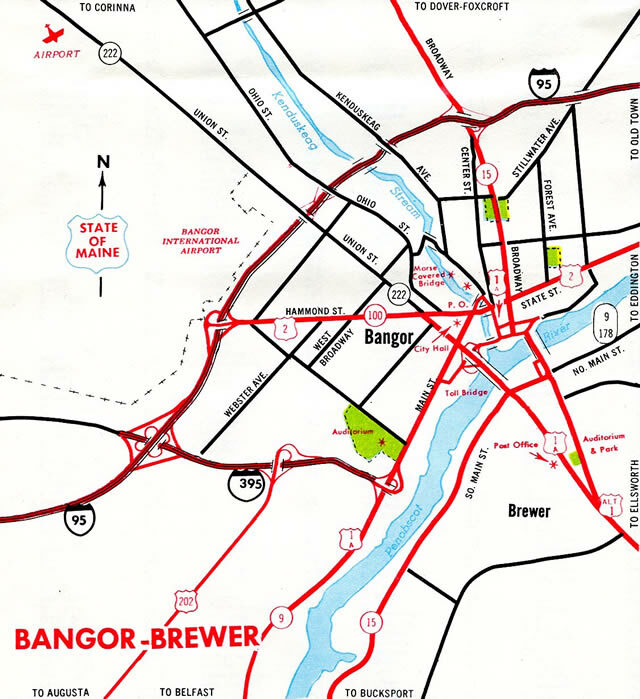 Completion of I-395 across the Penobscot River preceded the relocation of SR 15 to bypass Downtown Bangor. The former route along Broadway became SR 15 Business. A trumpet interchange (Exit 6A) connects the end of Interstate 395 with U.S. 1A (Wilson Street) in one mile. Photo taken by Ian Ligget (04/15/16). Traffic partitions into single lane ramps for U.S. 1A (Main Road) south to Ellsworth and Bar Harbor and U.S. 1A (Wilson Street) north to the Brewer city center. Photo taken by Ian Ligget (04/15/16). I-395 ends as Exit 6A departs for U.S. 1A east and unmarked Exit 6B returns drivers to Brewer. U.S. 1A east intersects Maine 46 (Lower Dedham Road / Kidder Hill Road) in 5.6 miles at East Holden. Beyond there the US highway enters Hancock County on the 23-mile drive to U.S. 1 in Ellsworth. Photo taken by Ian Ligget (04/15/16). U.S. 1A (Main Road) rises to cross over an abandoned railroad line on the half mile approach to Interstate 395 west. U.S. 1A forms a long loop to Bangor from U.S. 1 at Ellsworth and Stockton Springs. Photo taken by Ian Ligget (04/15/16). Motorists bound for Bangor are directed to Interstate 395 westbound in lieu of U.S. 1A (Wilson Street) through Brewer. Photo taken by Ian Ligget (04/15/16). U.S. 1A (Main Road) splits with Interstate 395. I-395 provides a high speed route to Interstate 95, five miles to the west while U.S. 1A lines Wilson Street west 2.7 miles to Main Street and the Brewer city center. Photo taken by Ian Ligget (04/15/16). Shield assembly posted along U.S. 1A (Wilson Street) southeast at Interstate 395 west. Design of the I-395/Route 9 connector outlines reconfiguring the trumpet interchange here to a three quarter cloverleaf with a westbound ramp added to the Eastern Maine Healthcare facility. Photo taken by Ian Ligget (02/23/16). The first sign of Interstate 395’s westbound conclusion appears at the Penobscot River crossing between Brewer and Bangor. Interchanges line both banks of the river for I-395. Exit 4 joins the freeway with Maine 15 (South Main Street) to the east and Exit 3 follows at U.S. 202 south, U.S. 1A and Maine 9 (Main Street) to the west. Photo taken by Ian Ligget (04/15/16). Two miles east of the exchange with Interstate 95 on I-395 west at Exit 3. Exit 3 serves Downtown Bangor and East Hampden via U.S. 1A and Maine 9 (Main Street). U.S. 202 begins in Bangor and travels south along Main Street to Interstate 395. The US highway merges onto westbound for a short distance to Exit 2. Photo taken by Ian Ligget (04/15/16). Interstate 395 westbound at the trumpet interchange (Exit 2) with U.S. 202 south. U.S. 202 ventures south from the freeway to Hampden as I-395 enters its final mile. Photo taken by Ian Ligget (04/15/16). Interests to Bangor International Airport (BGR) and Maine 15 (Broadway) north to Dover-Foxcroft are directed onto I-95 north from forthcoming Exit 1B. Photo taken by Ian Ligget (04/15/16). Exit 1B departs I-395 west for Interstate 95 and Maine 15 north to Bangor International Airport (BGR) and Orono. Orono, home to the University of Maine, lies ten miles to the north. Exit 184 with Maine 222 (Union Street) leads to the airport terminal. Photo taken by Ian Ligget (04/15/16). A loop ramp (Exit 1A) departs for I-95 south from Interstate 395 west. Interstate 95 turns west from Bangor 32 miles to Pittsfield and south 51 miles to Waterville. Motorists continuing west default into the intersection with U.S. 2 and Maine 100. Photo taken by Ian Ligget (04/15/16). End Interstate 395 shield posted beyond the full cloverleaf interchange with Interstate 95. Photo taken by Ian Ligget (02/23/16). U.S. 2 and Maine 100 turn west from Odlin Road and Bangor onto Hammond Street toward Hermon Center. The pair continue west along the Interstate 95 corridor to their split at Newport. Photo taken by Ian Ligget (04/15/16). U.S. 2 & Maine 100 (Odlin Road) west approach the intersection with Hammond Street west and Interstate 395 east. Odlin Road takes the US route around Bangor International Airport (BGR) between separate sections of Hammond Street. Photo taken by Ian Ligget (04/15/16). U.S. 2 & Maine 100 turn west onto Hammond Street as Hammond Street east transitions into the beginning of Interstate 395 through the adjacent exchange with I-95. Odlin Road south parallels I-95 southwest to Cold Brook Road. Photo taken by Ian Ligget (04/15/16). U.S. 2 and Maine 100 (Hammond Street) east approach the busy intersection with Odlin Road and Interstate 395 east. Photo taken by Ian Ligget (04/15/16). Odlin Road ties into the freeway beginning from Cold Brook Road and Ammo Industrial Park to the south. U.S. 2 and Maine 100 eastbound turn onto Odlin Road north to rejoin Hammond Street at I-95 (Exit 183) to the left. Photo taken by Ian Ligget (04/15/16). Exit 1A quickly departs Interstate 395 eastbound for I-95 south to Newport, Waterville, Augusta and Portland. Photo taken by Ian Ligget (04/15/16). A loop ramp (Exit 1B) follows for Interstate 95 & Maine 15 north. Maine 15 follows I-95 north from Exits 182 to 185 (Broadway), and I-395 from Exit 1 to Exit 4 to bypass Downtown Bangor. Photo taken by Ian Ligget (04/15/16). A mixture of shields accompany Interstate 395 on Exit 182 guide signs along I-95 north. I-395 provides connections to U.S. 2 and Maine 100 (Odlin Road / Hammond Street) to the west and U.S. 1A and Maine 9 to the east. Photo taken by Ian Ligget (04/15/16). The eastbound off-ramp to Interstate 395 (Exit 182A) provides a direct route to U.S. 1A (Main Road) east from Brewer. U.S. 1A travels southeast 28 miles from Bangor to Ellsworth and U.S. 1. Ellsworth is the gateway to Acadia National Park and Bar Harbor. Calais lies along U.S. 1 at the St. Croix River across from St. Stephen, New Brunswick. Photo taken by Ian Ligget (04/15/16). Interstate 95 northbound at the ramp departure (Exit 182A) for I-395 east & Maine 15 south. Exit 182B loops onto Interstate 395 west ahead of its intersection with U.S. 2 and Maine 100. Maine 9 meets the freeway at Exit 3 south of Downtown Bangor. The state route travels east from Brewer 90 miles to U.S. 1 at a point seven miles west of Calais. Photo taken by Ian Ligget (04/15/16). 1.25 miles ahead of Interstate 395 (Bangor Industrial Spur) on I-95 south at Exit 183 for U.S. 2 & Maine 100 (Hammond Street). Photo taken by Ian Ligget (04/15/16). U.S. 1A loops north from U.S. 1 at Stockton Springs and Ellsworth to connect Bangor and Interstate 395 with the Downeast & Acadia Region. Photo taken by Ian Ligget (04/15/16). Entering the full cloverleaf interchange (Exits 182B/A) with Interstate 395 on I-95 south. The west end of I-395 serves U.S. 2 and Maine 100 (Hammond Street) and a series of industrial parks at West Bangor. Photo taken by Ian Ligget (04/15/16). SR 15 south combines with I-395 east to South Brewer. Connections with U.S. 1A and SR 9 provide part of a truck bypass of Bangor and Brewer for motorists heading to the Canadian Maritimes. Photo taken by Ian Ligget (04/15/16). I-395/Route 9 Transportation Study – Overview, http://www.i395-rt9-study.com/overview.html former project web site. Accessed April 14, 2016. “‘Hanging over us’: Homeowners face uncertainty as I-395 plan ramps up.” Bangor Daily News, April 13, 2016. Page updated April 16, 2016.